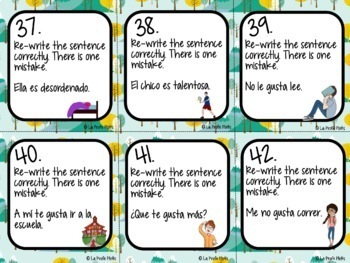 This task card set is designed to go along with Chapters 1A and 1B of the Spanish textbook Realidades 1. It has 48 different cards to get your students up and moving while getting a well-rounded review of all the different vocabulary and grammar covered in those chapters.. Students will be engaged as they complete various tasks on the included response sheet like answering questions about likes and dislikes, identifying verbs from pictures, translating vocabulary words from English to Spanish, making adjectives masculine and feminine, re-writing grammatically-incorrect sentences correctly, answering multiple choice questions, and responding to questions about likes, dislikes, and adjectives to describe themselves in complete sentences. Check out the thumbnails and preview for a sampling of cards/materials included with this set. These cards come in two versions: full color and ink-friendly with a plain white background! 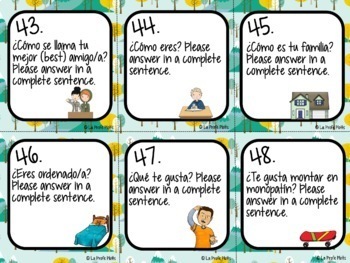 These task cards can be used in many different ways! • Cut up and distribute around classroom (hang up on walls, scatter on desks, even hide for some extra fun). Have students go around with sheet and answer any 30 (or whatever number you want to give them). Makes for great review before a test! • Use in conjunction with other activities during stations. • If you have a document camera, you could show students a card and have them write answers on mini whiteboards and hold up, either individually or as a team. • Extra five minutes left in class you hadn't planned on? Task cards always save the day! Pull out the task card set and use for a quick game, formative assessment, or rapid fire quiz for candy. 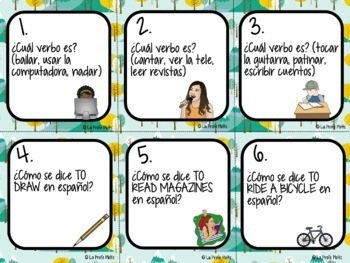 • Copy of my blog post in which I share seven of my favorite ways to use task cards in Spanish class! 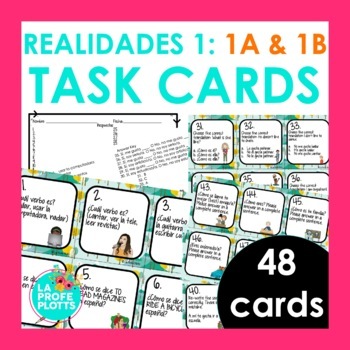 This set is included in my Spanish Realidades 1 Task Cards Bundle which includes ALL TEN of my Realidades 1 task card sets. Save 25% off the list price when you buy the money-saving bundle! Click HERE to see it! Need another engaging activity to help your students learn the vocabulary and grammar covered in this section? Check out the super fun Spanish Realidades 1: Capítulos 1A & 1B Jeopardy-style Trivia Game, Realidades 1 Capítulo 1A Pesca, and Realidades 1 Capítulo 1B Pesca games by clicking the links! Click the links below to check out my other task card sets! J.G.- I just did this activity for the first time on Thursday and I am so happy with the way it was received by the students! I allowed the students to use their notes if they wanted to, and only asked them to answer 30 out of the 48 questions in order to cut down on congestion in the room, (which is a constant issue with 32 students!) The students were engaged the entire time. I will definitely be back for some of the other tense cards! T.H.- I absolutely LOVE your task cards! So many uses!!! Thank you!!!! K.G.- Thanks so much for these cards! I bought them, made them and used them in class today already and it was a huge success. The kids loved the different style of working. S.M.- Excellent resource as always! I know your tasks cards are always a favorite in my classroom! M.N- I used this on a "stations day" with my students. They (and I) found it to be a very thorough review! L.D.- My students have done this activity several times and they LOVE IT! I love seeing them having fun trying to get the answers fast and helping each other. Thank you!!! K.L. This was the best way to review Spanish material. It was such a life saver. Thanks! Did you know you can follow my store and receive notifications when new resources are posted or upcoming sales? I have lots of engaging resources in the works and new resources (except the already-discounted bundles) are 50% off for the first 24 hours! Click the green star by my store name to follow me! Thanks for checking out my resource!